French food is on my mind! The creamy vichyssoise I wrote about yesterday put me in the mood for more treats from the French cuisine. I haven’t had a stew in along time so that’s first on my list. Meat braised for hours rewards your patience with the most tender and juicy meat. While it’s simmering slowly (for nearly 6 hours in the case of my stew) on low temperature it soaks up all the wonderful flavours, the red wine, herbs and spices. You just put it in the oven, forget about it and take out the finished meal. 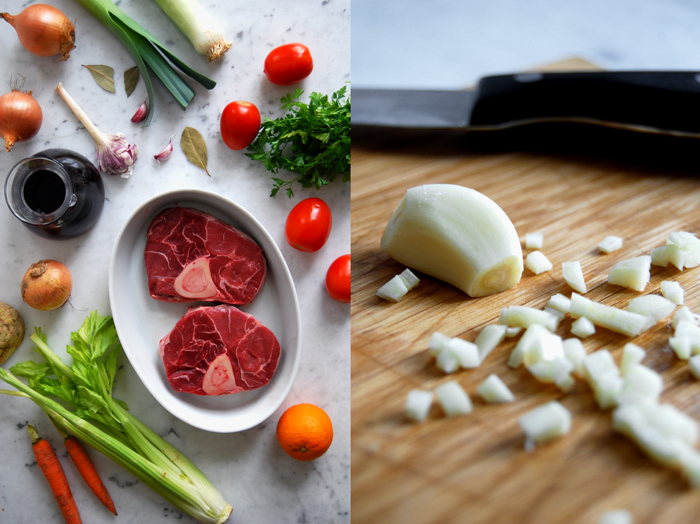 I like to use beef shank for stews, gelatinous with a bit of fat, it guarantees a succulent result, not dry at all and so tender that you could easily cut it with a fork. This stew is called a daube because in Southern France, it’s traditionally made in a daubière, a clay pot with a round belly, a narrow neck and a lid with a well which is filled with water. The evaporating water causes the cooking liquids to condense inside the lid, simple physics but more importantly it makes a great stew! Unfortunately, I don’t have a daubière but I found out that a casserole dish with a tight lid works just as well. 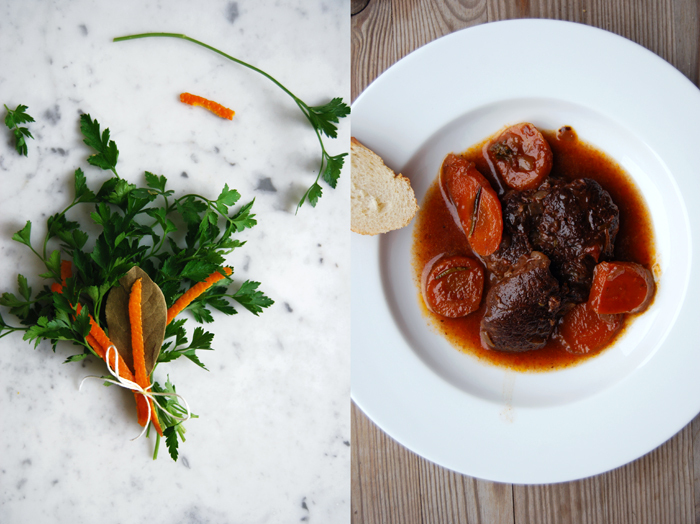 The wine, herbs and spices have a big impact on the quality and taste of a daube just as much as the right kind of meat and cooking dish. As much as I love recipes that focus on single strong flavours, I accept that a stew follows its own rule, more is more! 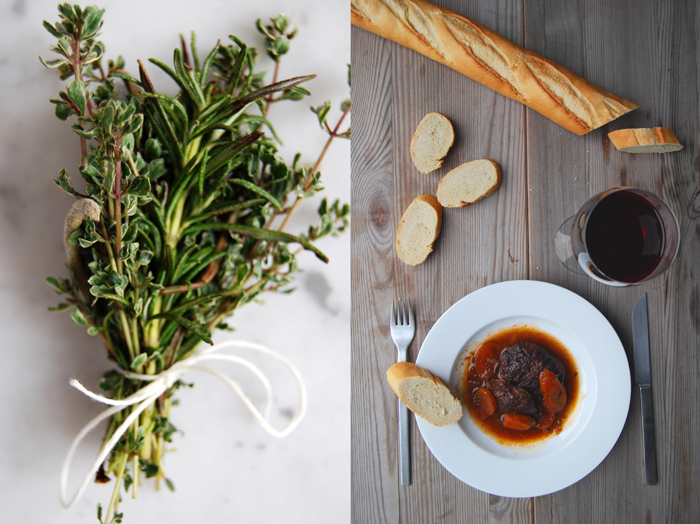 I prepared two different bouquets garni, one with parsley, bay leaf and orange peel and the other with rosemary, sage and thyme, combining all the aromas ripening under the sun of the Provençe. My open spice box inspired me to throw in a few cloves, allspice and cinnamon as well, they mixed in perfectly with the meat’s juices, the red wine, brandy, tomatoes, carrots and garlic. I’ve praised the meat’s tenderness already and the sauce impressed me just as much. It was so concentrated that I just had to dip a piece of baguette into the dark red juices to taste the whole spectrum of aromatic flavours united in this stew. A sip of my glass of French red wine made the Provençe experience complete! You need a big casserole dish with a tight lid. The daube has to cook in the oven for nearly 6 hours. Divide and bind with string in 2 bundles. Set the oven to 180°C / 355°F top/ bottom heat. In a large casserole dish, heat a splash of olive oil and fry the meat for a few seconds on both sides (in batches), season with salt and pepper and set aside. Add some more oil and fry the onions, garlic and carrots for a few minutes on medium heat. Deglaze with the brandy, add the meat and layer alternating with the vegetables, add the tomatoes, spices, broth and wine, the liquid should just cover everything. Season with salt and pepper and add the 4 bouquets garni. Put the casserole dish in the oven. After 45 minutes, turn the temperature down to 140°C / 285°F and cook for 5 hours. When the meat is done, remove the bouquets garni and cinnamon stick and season the daube with salt and pepper to taste. Serve with baguette or cooked potatoes. It looks so delicious that it makes me salivate just by looking at it and yes, it might be very aromatic too. Looks so yummy, Meike! 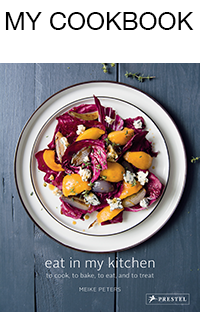 I love the idea of infusing it with so many flavors. Can’t wait to try! Mila, it was so good, I could have eaten the sauce with a spoon! I love a good rich and hearty daube and this looks absolutely wonderful. 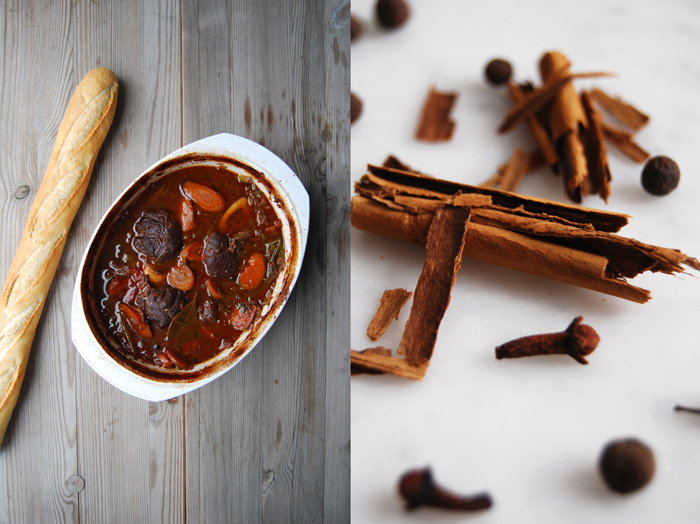 It’s grey and miserable here today – just the kind of day for a stew! Thank you Kathryn! 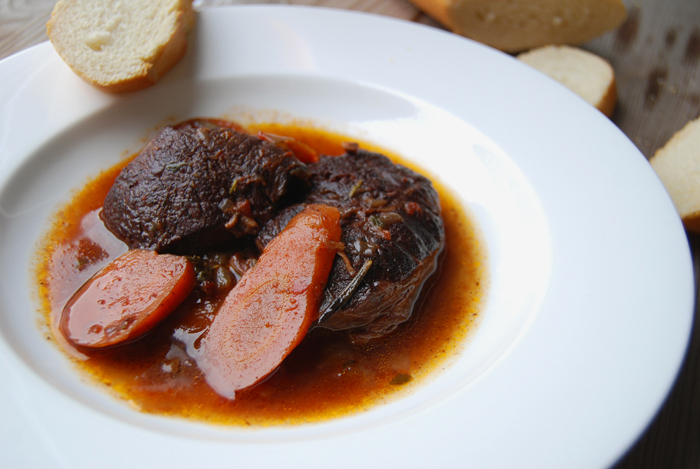 This daube is full of aromatic flavours, I love it! It’s so easy to prepare, you just put it in the oven and after 6 hours, you take it out and enjoy a wonderful meal!